There's no question about it – we're living through an important breakthrough moment for the global climate movement. Youth in the US led by Sunrise Movement have pushed a radical, intersectional proposal for a just and fair transition away from fossil fuels on the center stage of US politics. 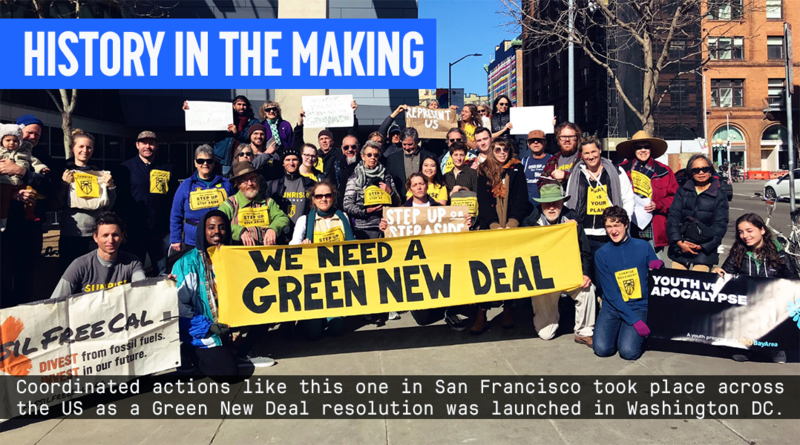 It's so inspiring to see years of hard community-led work paying off, not just in the US with the Green New Deal, but in campaigns all over the world: from Turkey to South Africa to Japan, people are achieving momentum we haven't seen for some time. I hope this news inspires you all to keep going, too. Rapid death of coal: There's been a cascade of banks backing out of big coal projects since I last wrote. In Japan, a massive coal-fired power plant planned for Chiba prefecture, across the bay from Tokyo, has been abandoned. Campaigners estimate the decision will avoid 12 million annual tons of CO2 emissions. Now they're working to ensure a liquified natural gas (LNG) plant doesn't get put on the same site. Meanwhile in British Columbia, Canada, a planned coal port that would have shipped coal over to Asia to be burned was rejected, after years of protest. And 2 more coal plants that were the sites of local resistance were defeated last week in Turkey and Australia, where a stinging court judgement cited the carbon budget and climate change. In South Africa too, a series of banks are walking away. 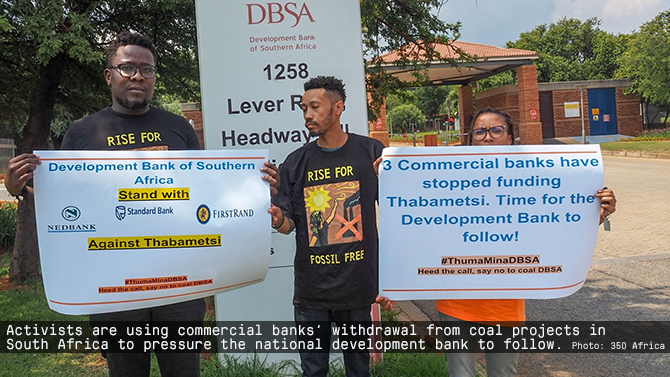 First, Nedbank announced they'd stop funding coal altogether, notably pulling out of Thabametsi and Khanyisa plants. Then FirstRand Group quickly followed, dropping Thabametsi. This momentum suggests the Development Bank of South Africa (DBSA) and ABSA, the last commercial bank on the project, might follow suit soon. You can help: add your voice to the call for the DBSA to say no to coal. This reminds me of a new campaign launched this week to demand the European Investment Bank (EIB) go Fossil Free. As the world's biggest public lender reviews its energy policy, and with so many commercial banks already dropping out of fossil fuels, it's really a no-brainer. You can sign the petition and browse the site for more info. And in the United States, Alexandria Ocasio-Cortez and Massachusetts Senator Ed Markey submitted a much-anticipated resolution for a Green New Deal (GND) to Congress last week. More than 100 events were organized across the country where people delivered a 100,000-strong petition to congressional offices, urging legislators to take a stand. By Monday, almost every Democratic hopeful for President in 2020 endorsed it. If you're wondering how what is arguably the most ambitious climate justice proposal in the country's history went from activists' vision to center stage in US politics in a matter of months, consider reading this compelling behind-the-scenes story on its rise. 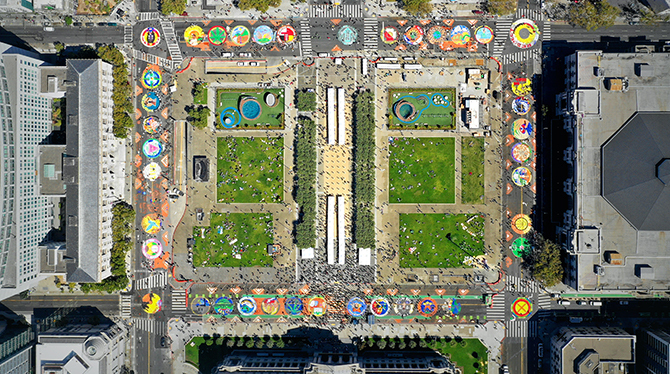 Remember this amazing street mural (the world's biggest!) from Rise for Climate last September? A new project, "We Will Paint the Future", tells the stories of the communities that came together and made it possible. Learn about the history of street murals in activism and hear firsthand from people who were there on that beautiful day. And: a handful of 350.org founders reflect on a long overdue but very meaningful win from Vermont: Middlebury College, where 350.org came into being almost ten years ago, finally divested from fossil fuels last week! 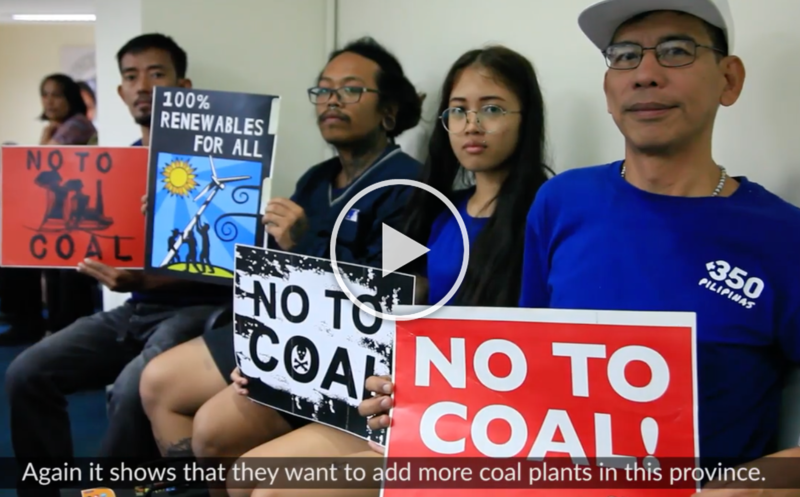 In Quezon, just southeast of Manila in the Philippines, people are standing strong and pushing back against local government's unquestioning approval to fast track more coal projects in the region. This 3-minute video shows all you need to know. Every week right here, I give a way to help grow this movement for a Fossil Free world. 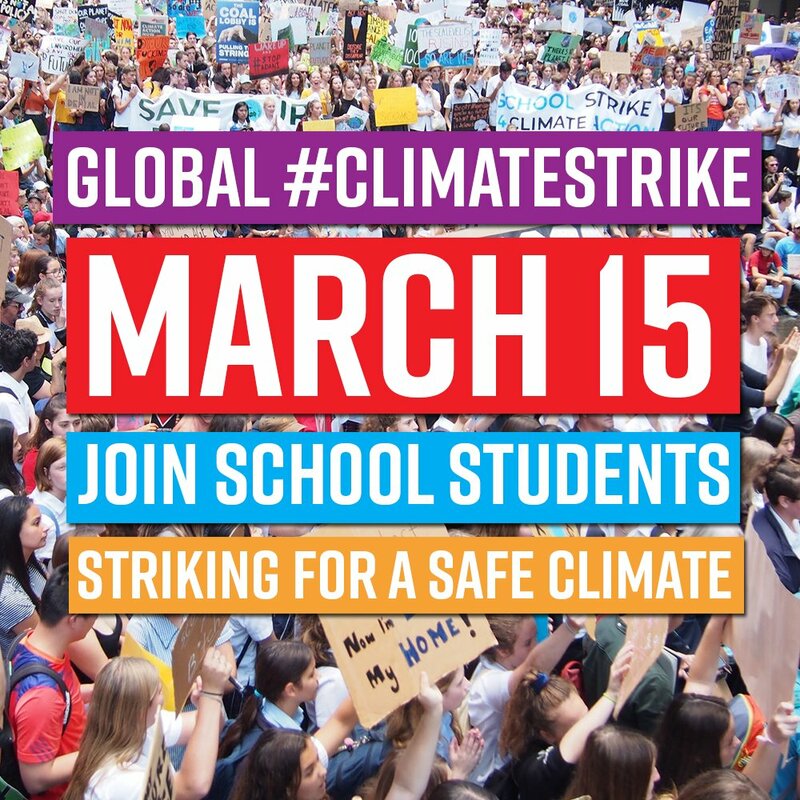 I've got a special request this time: start looking in to how you can support the global student strike on March 15. It's not only for school students. From taking photos and sharing them online with #climatestrike, to helping sort out on-the-ground logistics, or speaking to other parents and young ones in your family, we can all play a role. Some schools and teachers unions are even explicitly backing the actions. Maybe yours will too? That's it for now! See you in two weeks with more of your news. You're receiving this update because you signed up to receive updates about the Fossil Free campaign from 350.org.